Recovering your arm and shoulder movement after a stroke can be challenging. 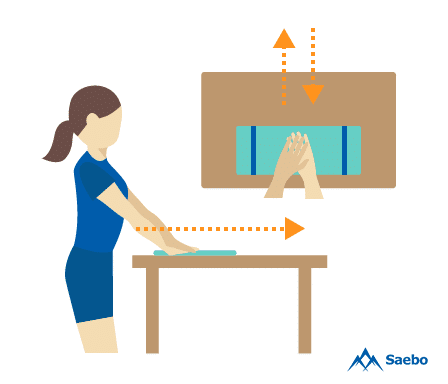 If you can’t easily grasp and release objects, move your arms forward, or use your arms to support your weight or you’re just starting your recovery with a Saebo solution, it’s important to incorporate helpful shoulder exercises for stroke recovery into your daily routine at home. And that’s exactly what Occupational Therapist Hoang Tran recommends. Hoang focuses on shoulder and arm mobility at her outpatient rehabilitation center, Hands on Therapy. She opened the Florida center in 2014 after extensive clinical experience, including more than a decade at Miami Beach’s Mount Sinai Medical Center. As a Certified Hand Therapist (CHT) she specializes in pathological conditions affecting the upper extremities. Throughout her years of working with stroke survivors and other people with upper body trauma, she has learned several simple and effective techniques that you can apply in your own home to speed up your recovery. Hoang knows how crucial it is to expedite your progress as much as possible, and she also understands the importance of supplementing your outpatient therapy with at-home exercises. She recommends the following shoulder exercises for stroke recovery, especially for survivors who lost strength or function in their upper arm. 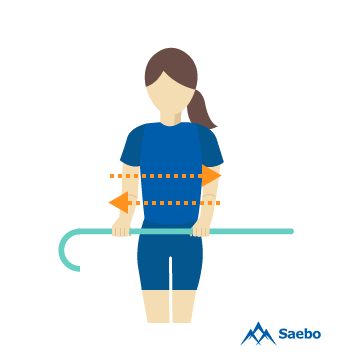 These low-impact exercises are mainly based on the principles of gravity compensation and are commonly performed in conjunction with two of Saebo’s shoulder products, the SaeboMAS and the SaeboGlide. Make sure to look at our collection of stroke recovery exercises for the entire body, and download your FREE stroke recovery exercise guide today. Though strokes are life-threatening and often cause irreversible neurological damage, you may be able to retrain other regions of your brain to make up for this damage. Your muscles must remain active if you hope to use them again, and some exercises aim to achieve this specific task. These two basic-level exercises are recommended for people who still struggle to move or use their shoulder after a stroke. If you have completely or partially lost function – or even sensation – in one side of your body after your stroke, you still have a very powerful tool at your disposal: the other side of your body. The first exercise will help you use your functioning hand to stretch and stimulate your shoulder muscles. The second focuses on your shoulders themselves, specifically the muscles that allow you to move your shoulder blade on the unaffected side of your body. Get a towel and sit down at a table, desk, or other flat surface. Fold or spread the towel, and make sure it’s on the table immediately in front of you. Now, place your affected hand on the towel and put your unaffected hand directly on top of it. Apply enough pressure to keep your hands together, then use your hand to slide the towel away from you, toward the middle of the table. As your hands move forward, your shoulders will also stretch forward, with the towel reducing friction and allowing your shoulder muscles to stretch and strengthen. If you feel comfortable leaning forward with your upper body, do so in order to slide the towel even farther forward. If you can do this until your arms are almost parallel with your body, the extra movement will allow you to stretch your shoulders at shoulder level, paving the way for a greater range of motion. 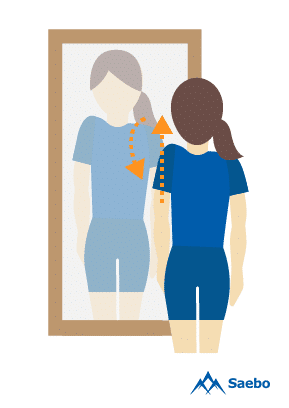 Sit or stand in front of a mirror so that you can clearly see your entire upper body. Now, lift your unaffected shoulder up in a shrugging motion, just as you would if you didn’t know the answer to a question. Instead of simply letting it drop again, roll your shoulder back. As you do so, your shoulder blades should get closer together. Repeat this exercise several times each day. These intermediate exercises are ideal if you’ve already made some progress toward shoulder mobility and control. If you cannot perform them, you may want to continue repeating the basic-level exercises, but don’t forget to continue making attempts at these exercises too. They will require a towel, a table, and a cane or any other long, light object. This exercise is very similar to the basic-level towel slide, but it incorporates a bigger range of motion by challenging you to stretch your shoulder muscles in more than one direction. Start by sitting at a table with a towel and placing your affected hand on it, as before. Now use your other hand to slide your hand forward, but don’t simply slide it back toward you. Instead, follow this movement by sliding it from side to side. Now slide it back toward you and continue sliding the towel from side to side. Finally, incorporate all of these movements into a series of circular motions, alternating between clockwise and counterclockwise. You’ll need a cane or lightweight umbrella for this exercise. Hold the cane with both hands in front of your body with your arms bent at a 90-degree angle at your sides. Next, push the cane outward to your left and right without dropping your arms, so that the 90-degree angle remains consistent. This exercise will improve your ability to perform external rotations with your shoulders, which are required for a significant number of everyday tasks. Finally, a couple of advanced exercises are particularly useful for people who can already grasp objects with their affected hand and move their affected shoulder. If you still haven’t regained complete range of motion in both shoulders, but you have enough strength and function to grab and reach in different directions, you may find these helpful. 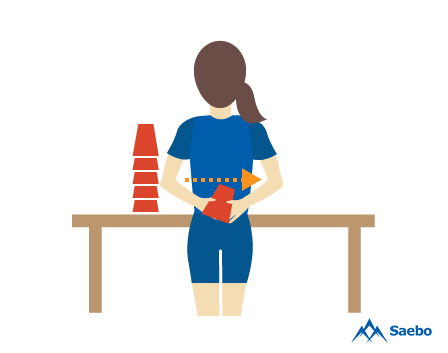 To perform them, you’ll need at least five or six cups that can be stacked. Disposable plastic or paper cups are usually the most effective, because they’re more lightweight than glasses or hard plastic cups. 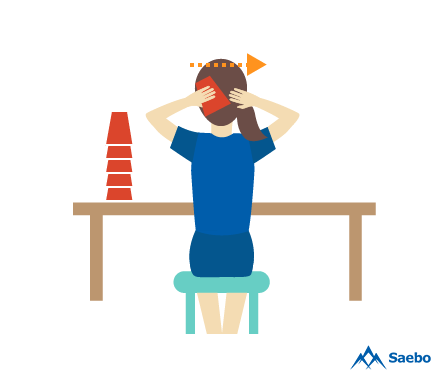 Sit at a table and stack the cups right in front of you. Before you begin, remind yourself to keep looking forward throughout the exercise. It may help to train your sights on one specific point ahead of you, such as a painting on the wall or your own reflection in the mirror. Now, grab the first cup from the stack. While continuing to look forward, pass the cup behind your neck and use your other hand to retrieve it and set it back down on the table. Continue doing this until you’ve passed the entire stack of cups from one hand to the next. Stand in front of the table, or sit on a stool or backless chair. Re-stack the cups on the table, and bring the first one behind your waist, passing it along the top of your pants line. Retrieve and replace it with the other hand, and repeat. The majority of strokes occur in people older than 65, and your risks begin to increase after the age of 55. Survivors can take action to improve their quality of life at any age, so it’s important to remain hopeful and proactive instead of assuming the worst. These shoulder exercises for stroke recovery are among the most effective physical therapy techniques, because they tackle the muscles you need the most to regain independence: those in your upper body. If you’ve suffered from one or more strokes and lost mobility as a result, these exercises will allow you to reclaim control and begin the fulfilling task of retraining your joints and muscles, even after neurological damage. 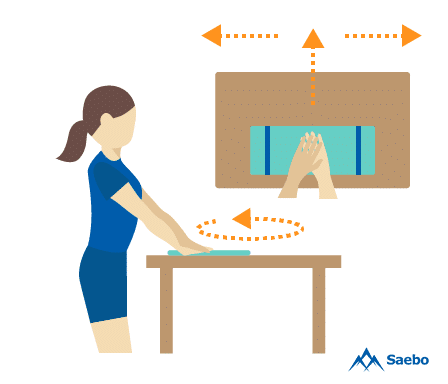 What are the go-to Saebo solutions we recommend to transform your shoulder rehab? The SaeboMas and the SaeboGlide. The SaeboMAS is a zero-gravity arm support that would be an ideal assistive device for many individuals with moderate to severe shoulder weakness. Additionally, the SaeboMAS mini is a smaller version that is perfect for home therapy and pediatric rehabilitation. The SaeboGlide is specifically designed to challenge stroke survivors at all stages of recovery. By using a gliding sleeve, stroke survivors can perform various controlled arm exercises at the appropriate strength level. Learn more about the SaeboMAS from Saebo patients and Saebo trained Occupational Therapists on our testimonials page. You can even take our products for a test drive for free (trial availability may vary by product and location). Enter your information below to receive regular email updates on new Saebo products, special offers, exciting news, and important information on stroke recovery and clinical research. Be sure to follow us on Facebook for even more great information and exclusive updates on new product offerings!